I’ve drawn lots of mandalas this week. I never have a clear idea of how my mandalas will look when they’re finished, so I have to work out which shapes fit together best and how to fix mistakes as I go along. The term ‘mandala’ has its origins in a Sanskrit word meaning ‘circle, and they have been used as a tool for prayer and meditation throughout history and in many cultures. In Buddhism, mandalas symbolise the ideal form of the universe. I find drawing mandalas therapeutic. I like the process of drawing simple shapes which, when put together, produce a complex design. Here’s one of the mandalas I drew this week. 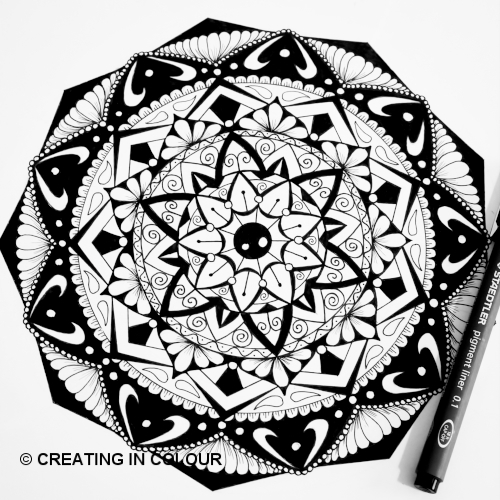 You can see more of my mandalas here. Thank you, Valerie. Your comment is very much appreciated. Beautiful. I love the strong contrast of black and white. Hi, June. Thank you for commenting. The thing that first attracted me to ink drawings was the contrast between black and white. Thank you, Regine, for commenting. your ink drawings are just superb John. Gorgeous mandala! Happy PPF! Hi, Linda. Thank you for your kind comment. Absolutely great mandala. I adore details you did skillfully. Hi, sirkiss. Thank you for your kind comment. Sheer perfection John. I have to say if I was to have a vision of where I was going with this sort of doodle I would never get started as I'd be over thinking it all the time. You have a very methodical mind, mine always gives me an idea and then just goes with which ever way the wind blows hee hee!! Thank you, Tracy. I think we all have a predilection to overthink at times. I prefer to go with the flow. Things will sort themselves out, most of the time. Wow! John this is simply stunning. You have an eye and a talent for putting this together. Well done indeed. Thank you, Nicole, for visiting and for your kind comment. I think many mandalas looks like flowers with flower elements in them. So is this one. Love it! Thank you, NatureFootstep. Glad you like it.